Centered around the cathedral and castle, the city of Lincoln in the heart of Historic County of Lincolnshire is full of attractive buildings, including fine 16th century and Georgian properties. Excellent shopping and leisure facilities are also available, making Lincoln an ideal location for a short break holiday. Visit the city centre and you step back in time. Lincoln was a Roman town rivaling London in importance and many traces of this time in the city’s history remain – remnants of the old city wall, aqueduct and well can still be seen. The 3rd-century Newport Arch is believed to be the only Roman arch still used by traffic. In Viking times Lincoln was an important trading centre producing coins at its own mint. But it is the Normans who left the finest reminders of the past – the cathedral and the castle. 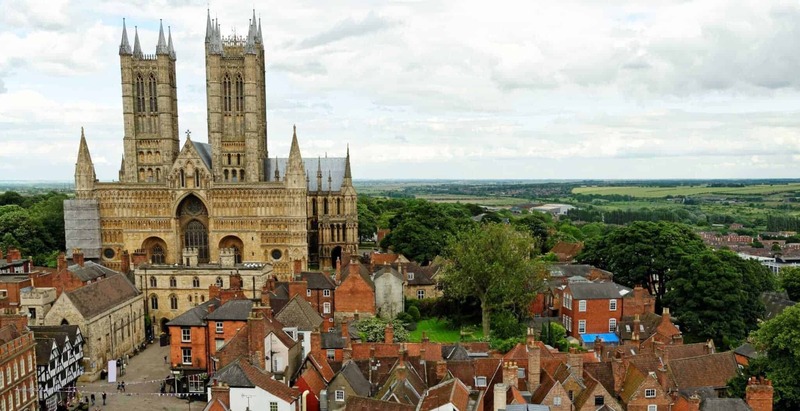 At the top of the hill you will find the heart of Lincoln – its cathedral. This magnificent 900 year old medieval building crowns the city – people come from all around the world to experience its huge gothic beauty and superb music – there are daily church services led by the resident choir. It is the third building to occupy the site, the original Church of A.D. 953 was replaced in 1072 by the Norman Cathedral of which only part of the west front now remains. Following a disastrous fire and earthquake, work on the present gothic structure was begun by St.Hugh in 1192. The vast nave with its limestone and marble columns, vaulted roof, and colourful stained glass windows is an impressive sight. Inside are two famous stained glass windows, the Dean’s Eye and the Bishop’s Eye, as well as the famous Lincoln Imp. High in the Angel Choir, at the top of one of the columns, is the stone carving of an imp laughing mischievously, sitting with one leg across his knee. According to legend, the Lincoln imp was a demon, blown into Lincoln Cathedral by a terrible storm. This mischievous imp proceeded to dance on the altar, tripped up the Bishop, knocked over the Dean and teased the choir! The Cathedral’s guardian angels witnessed this chaos and turned the imp into stone, placing him high up above the Angel Choir. Only some 12 inches high, the mischievous imp has probably lured more people to Lincoln Cathedral than anything else. The Lincoln imp has even been adopted as the unofficial symbol of the city! Just across the cobbled square from the cathedral stands Lincoln’s Norman Castle. Built on the site of the former Roman fortress, this defensive stronghold has long been the centre of the City’s judicial and penal systems. The Crown Court still sits here, upholding the principals of justice established by Magna Carta, and Lincoln’s original copy of this famous document, sealed by King John at Runnymede in 1215, is the centrepiece of a special exhibition. You can also visit the Castle’s unique prison chapel, tour the towers and dungeons, and walk along the walls with panoramic views across the city. In the shadow of the castle and cathedral is the old quarter of Bailgate and Steep Hill, where you can find small specialist shops, ancient pubs and restaurants, including the tiny Jew’s House (perhaps England’s oldest domestic residence, a 12th-century Jewish merchant’s house). At the foot of the hill, you will find Stonebow (the southern gateway to the medieval city) and High Bridge – a vaulted Norman stone bridge supporting a medieval building, now tearooms. The former Roman harbour, Brayford Pool, is now a bustling marina fed by the waters of the River Witham, where you can watch the many colourful narrow boats and pleasure craft. The city’s new University, opened in 1996, occupies a waterside plot here. Lincoln is also famous for its Christmas Market – in early December nearly half-a-million people visit the city to buy festive gifts, eat festive food and ride the fairground attractions in the castle grounds and the streets around the cathedral. Try our interactive map of Roman Sites in Britain to browse our vast database of visible Roman remains. Lincoln is easily accessible by both road and rail, please try our UK Travel Guide for further information.